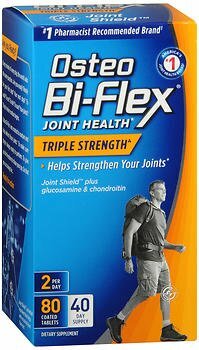 Osteo Bi-Flex was created to help protect your joints and to nutritionally support joint mobility. * It features legendary Joint Shield plus glucosamine, which strengthens your joints one dose at a time, so that you can go about your business - comfortably. * Experience true joint comfort for yourself with Osteo Bi-Flex. * Free of Gluten. *These statements have not been evaluated by the Food and Drug Administration. This product is not intended to diagnose, treat, cure or prevent any disease. If you have any questions about this product by Osteo Bi-Flex, contact us by completing and submitting the form below. If you are looking for a specif part number, please include it with your message.